Roisin Duffy, the producer-presenter of the TV documentary Fr Browne’s War, was in London to introduce a special showing of the film in the Irish Embassy on Wednesday 17 May. She was the guest of Dan Mulhall, the Irish Ambassador to England who has been hosting a series of discussion evenings on chaplains in WWI, in the embassy. Among the invited guests were representatives of the Irish Guards and Chelsea Pensioners, former Irish President Mary McAleese and Heather Jones, Associate Professor of history in the London School of Economics (LSE). Professor Jones has a special interest in the role played by chaplains during the First World War and was one of the commentators on Roisin Duffy’s film, aired first on RTE television in March 2014. 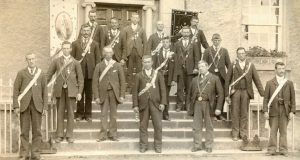 It was warmly received then and subsequently nominated for an Irish Film and Theater Award (IFTA). It told the story of Frank Browne, the renowned Jesuit photographer of Titanic fame, who over his lifetime took thousands of photographs, beautifully shot and composed. The forty six thousand negatives of most of his work were only discovered after his death. Fr Browne served as a chaplain for most of WWI and wrote thousands of letters home to bereaved families. 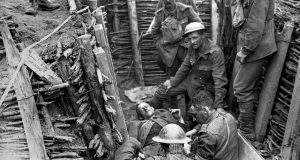 He spent his time in the trenches attending to the sick and dying, saying mass and hearing confession, getting injured himself and still somehow managing to take incredible photographs of the horror going on around him. In her introductory talk Roisin Duffy described him as the first war photo-journalist. 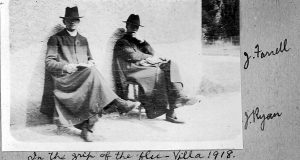 As she researched the material on Fr Browne in the Irish Jesuit Archives in Leeson St she grew in her admiration of a man who was brave, talented and utterly dedicated to the young soldiers he ministered to. Dan Mulhall also spoke of his admiration for Fr Browne not just as a world class photographer but as someone who saw his faith as calling him to serve in the most terrible of conditions. And indeed after the screening of the documentary film some of the post-film discussions focused on the the role of religion on the battleground. Heather Jones noted that the Anglican Church at the time saw it as a opportunity to evangelise or deepen belief among the young soldiers. She said that if it was the case that their faith deepened in the face of death, it certainly did not last among most of the survivors lucky enough to return to their homes after the war. 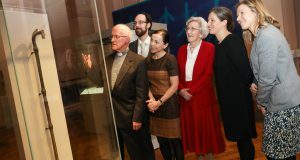 There was much reference made to the famed chaplain Willie Doyle SJ, whose relatives were also present.Rosin Duffy said that he was a hero for Fr Browne and both men were utterly devoted to the young soldiers they had come to serve as chaplains. Willie Doyle was loved by the men and seen as invincible by them. In his presence they felt safe, and often loved to visit his ‘lucky dugout’. His death was a profound blow to them and to his fellow Jesuit chaplains. At the end of what Roisin said was as a most engaging evening, the RTE journalist received several invitations from interested parties in London to show Fr Browne’s War in their various headquarters. 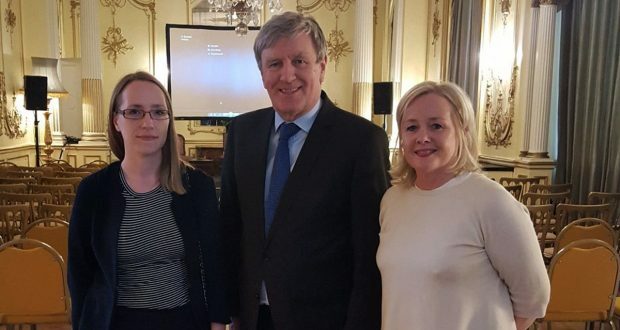 Photo: Dan Mulhall, Irish Ambassador to London with Roisin Duffy, RTE, (right) and Heather Jones, LSE.